Staraya Ladoga (Russian: Ста́рая Ла́дога, IPA: [ˈstarəjə ˈladəɡə]); Finnish: Vanha Laatokka; Old Norse: Aldeigjuborg) is a rural locality (a selo) in Volkhovsky District of Leningrad Oblast, Russia, located on the Volkhov River near Lake Ladoga, 8 kilometers (5.0 mi) north of the town of Volkhov, the administrative center of the district. It used to be a prosperous trading outpost in the 8th and 9th centuries. A multi-ethnic settlement, it was dominated by Scandinavians who were called by the name of Rus'. For that reason, it is sometimes called the first capital of Russia. The fortress of Ladoga was built in the 12th century and rebuilt 400 years later. It is now mostly reconstructed since being heavily damaged during World War II. Dendrochronology suggests that Ladoga was founded in 753. Until 950, it was one of the most important trading ports of Eastern Europe. Merchant vessels sailed from the Baltic Sea through Ladoga to Novgorod and then to Constantinople or the Caspian Sea. This route is known as the trade route from the Varangians to the Greeks. An alternative way led down the Volga River along the Volga trade route to the Khazar capital of Atil, and then to the southern shores of the Caspian Sea, all the way to Baghdad. Tellingly, the oldest Arabian Middle Age coin in Europe was unearthed in Ladoga. The original inhabitants of the settlement were Norsemen. The hypothetical original Finnic name, Alode-joki (i.e., "lowland river"), was rendered as Aldeigja in Old Norse and later as Ladoga in Old East Slavic. Staraya is Russian for "Old". According to the Hypatian Codex that was created at the end of the 13th century, the legendary Varangian leader Rurik arrived at Ladoga in 862 and made it his capital. Rurik later moved to Novgorod and his successors then to Kiev where foundations for the powerful state of Kievan Rus' were laid. There are several huge kurgans, or royal funerary barrows, at the outskirts of Ladoga. One of them is said to be Rurik's grave, and another one—that of his successor Oleg. The Heimskringla and other Norse sources mention that in the late 990s Eric Haakonsson of Norway raided the coast and set the town ablaze. Ladoga was the most important trading center in Eastern Europe from about 800 to 900 CE, and it is estimated that between 90% to 95% of all Arab dirhams found in Sweden passed through Ladoga. Ladoga's next mention in chronicles is dated 1019, when Ingigerd of Sweden married Yaroslav of Novgorod. Under the terms of their marriage settlement, Yaroslav ceded Ladoga to his wife, who appointed her father's cousin, the Swedish earl Ragnvald Ulfsson, to rule the town. This information is confirmed by sagas and archaeological evidence, which suggests that Ladoga gradually evolved into a primarily Varangian settlement. At least two Swedish kings spent their youths in Ladoga, Stenkil and Inge I, and possibly also King Anund Gårdske. In the 12th and 13th centuries, Ladoga functioned as a trade outpost of the powerful Novgorod Republic. Later its trade significance declined and most of the population engaged in fishing in the 15th century. After new fortresses such as Oreshek and Korela were constructed in the 14th century further to the west of Ladoga, the town's military significance also decreased. Ladoga belonged to Vodskaya Pyatina of the Republic and contained eighty-four homesteads in the 15th century; most of the land belonged to the church. The Novgorodians built there a citadel with five towers and several churches. The reconstruction of one of the towers of Staraya Ladoga's fortress was scheduled to be completed in 2010. The heart of Staraya Ladoga is an old fortress where the Yelena River flows into the Volkhov. In earlier times, it was a strategic site because it was the only possible harbor for sea-vessels that could not navigate through the Volkhov River.The fortress was rebuilt at the turn of the 15th and 16th centuries. In 1703, Peter the Great founded the town of Novaya Ladoga (New Ladoga) closer to the bank of Lake Ladoga. The ancient fortress thenceforth declined and came to be known as Staraya Ladoga (Old Ladoga), in order to distinguish it from the new town. The mid-12th-century churches of St. George and of Mary's Assumption stand in all their original glory. Inside St. George's, some magnificent 12th-century frescoes are still visible. In addition, there is a mid-12th-century church of St. Climent, which stands in ruins. St. George's Church in the Ladoga Fortress. St. George's Church contains frescoes painted in 1167. There is also the Assumption Nunnery/Monastery, and a monastery, dedicated to St. Nicholas which was constructed mainly in the 17th century. Staraya Ladoga's barrows, architectural monuments, and romantic views of the Volkhov River have always been drawing attention of Russian painters. There were the artists Ivan Aivazovsky, Orest Kiprensky, Aleksander Orłowski, Ivan Ivanov, Alexey Venetsianov and many others in the 19th century. A future member of the Imperial Academy of Arts and the Peredvizhniki group Vassily Maximov was born and laid to rest there. He portrayed scenes from an everyday life of peasants. In February 1945 the ex-estate of the prince Shakhovskoy was given to Leningrad artists as a base zone for the rest and creative work. The restoring works continued 15 years from 1946. But Leningrad artists began to arrive to Staraya Ladoga from 1940s. It became a source of inspiration for Sergei Osipov, Gleb Savinov, Nikolai Timkov, Arseny Semionov and many others for many years. A House of creativity «Staraya Ladoga» began to work permanently in the beginning of 1960s after the finish of the restoration. It was an important center of the art life of Russia for 30 years. Such artists as Evsey Moiseenko, Alexander Samokhvalov, Vecheslav Zagonek, Dmitry Belyaev, Vladimir Ovchinnikov, Boris Ugarov, Boris Shamanov, Vsevolod Bazhenov, Piotr Buchkin, Zlata Bizova, Taisia Afonina, Marina Kozlovskaya, Dmitry Maevsky, Alexander Semionov, Arseny Semionov, Irina Dobrekova, Vladimir Sakson, Gleb Savinov, Elena Zhukova, Sergei Zakharov, Ivan Varichev, Veniamin Borisov, Valery Vatenin, Ivan Godlevsky, Vladimir Krantz, Lazar Yazgur, Irina Dobrekova, Piotr Fomin and many other Leningrad and other regions painters and graphic artists worked there. In 1970-1980 a House of Creativity was widening, the new buildings were built. They used it a whole-year. A dwelling there for 1–2 months was without any payment for them. All commitments on habitation, feed and journeys took the Art Foundation of Russian Soviet Federative Socialist Republic. The paintings created there were exposed in the first-rate art exhibitions. It completed the collections of the main museums of Soviet Union and numerous private collections of Russia and abroad. Also it became a base of an extensive found of painting, graphics and sculpture of the museum “Staraya Ladoga”. Financing of the House of Creativity stopped at the beginning of the 1990s on the breakup of the USSR and after the liquidation of the Art Foundation. It stopped to receive the artists and was closed. ^ a b Chernykh, N.B. (1985). Дендрохронология древнейших горизонтов Старой Ладоги (по материалам раскопки Земляного городище) (Dendrochronology of the Oldest Layers of Staraya Ladoga (from the Excavation Materials)). Новые археологические открытия (New Archeological Discoveries). I. Leningrad. p. 79. ^ a b Bernadsky, Viktor Nikolayevich (1961). Новгород и новгородская земля в XV веке [Novgorod and the Novgorod Land in the 15th Century]. Leningrad: USSR Academy of Sciences. pp. 130–131. ^ "В Старой Ладоге в 2010 году воссоздадут Стрелочную башню крепости" [In 2010, Strelochnaya Fortress Tower Will Be Re-Created in Staraya Ladoga] (in Russian). Leningrad Oblast: karpovka.net. August 22, 2009. Retrieved July 27, 2015. ^ Н. В. Мурашова, Л. П. Мыслина. Дворянские усадьбы Санкт-Петербургской губернии. Южное Приладожье. Кировский и Волховский районы. — СПб, Алаборг, 2009. C. 207—224. ^ a b Д. П. Бучкин. О доме творчества «Старая Ладога» // Д. П. Бучкин. Гравюры и рассказы. — СПб, Бибилиотека «Невского альманаха», 2004. — С. 10. ^ А. Н. Самохвалов. Ладога, и не только Ладога // А. Н. Самохвалов. Мой творческий путь. — Л: Художник РСФСР, 1977. — С. 102 —113. ^ А. Н. Самохвалов. В поисках монументальной выразительности // А. Н. Самохвалов. В годы беспокойного солнца. — СПб: Всемирное слово, 1996. — С. 193 —194. ^ Баршова И., Сазонова К. Александр Николаевич Самохвалов. — Л: Художник РСФСР, 1963. — С. 50. ^ Стенографический отчёт заседания Правления ЛССХ совместно с Правлением Ленизо и Художественным фондом по обсуждению плана работ на 1945 год и о подготовке к выставке 1945 года // Центральный Государственный Архив литературы и искусства. СПб. Ф.78. Оп.1. Д.49, Л.8. ^ Л. С. Конова. Санкт-Петербургский Союз художников. Краткая хроника 1932-2009 // Петербургские искусствоведческие тетради. Выпуск 20. — СПб, 2012. — С.176. ^ А. Н. Семёнов, С. И. Осипов, К. А. Гущин. Выставка произведений. Каталог. Авт. вступ. статьи Г. Ф. Голенький. — Л: Художник РСФСР, 1977. — С. 4. ^ Зональная выставка «Ленинград». — Л: Художник РСФСР, 1965. — С. 9, 13, 14, 15, 19, 21, 25, 31. ^ Изобразительное искусство Ленинграда. — Л: Художник РСФСР, 1976. — С. 15, 16, 17, 19, 32. Законодательное собрание Ленинградской области. Областной закон №56-оз от 6 сентября 2004 г. «Об установлении границ и наделении соответствующим статусом муниципального образования Волховский муниципальный район и муниципальных образований в его составе», в ред. Областного закона №17-оз от 6 мая 2010 г «О внесении изменений в некоторые областные законы в связи с принятием федерального закона "О внесении изменений в отдельные законодательные акты Российской Федерации в связи с совершенствованием организации местного самоуправления"». Вступил в силу через 10 дней со дня официального опубликования (24 сентября 2004 г.). Опубликован: "Вестник Правительства Ленинградской области", №27, 14 сентября 2004 г. 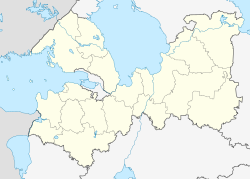 (Legislative Assembly of Leningrad Oblast. Oblast Law #56-oz of September 6, 2004 On Establishing the Borders of and Granting an Appropriate Status to the Municipal Formation of Volkhovsky Municipal District and to the Municipal Formations Comprised By It, as amended by the Oblast Law #17-oz of May 6, 2010 On Amending Various Oblast Laws Due to the Adoption of the Federal Law "On Amending Various Legislative Acts of the Russian Federation Due to the Improvement of the Organization of the Local Self-Government". Effective as of after 10 days from the day of the official publication (September 24 2004).). А.Н. Самохвалов. Ладога, и не только Ладога // А. Н. Самохвалов. Мой творческий путь. — Л: Художник РСФСР, 1977. А.Н. Самохвалов. В поисках монументальной выразительности // А. Н. Самохвалов. В годы беспокойного солнца. — СПб: Всемирное слово, 1996. Д.П. Бучкин. О доме творчества «Старая Ладога» // Д. П. Бучкин. Гравюры и рассказы. — СПб, Бибилиотека «Невского альманаха», 2004. Н. В. Мурашова, Л. П. Мыслина. Дворянские усадьбы Санкт-Петербургской губернии. Южное Приладожье. Кировский и Волховский районы. — СПб, Алаборг, 2009. Л. С. Конова. Санкт-Петербургский Союз художников. Краткая хроника 1932-2009 // Петербургские искусствоведческие тетради. Выпуск 20. — СПб, 2012. Wikivoyage has a travel guide for Staraya Ladoga.